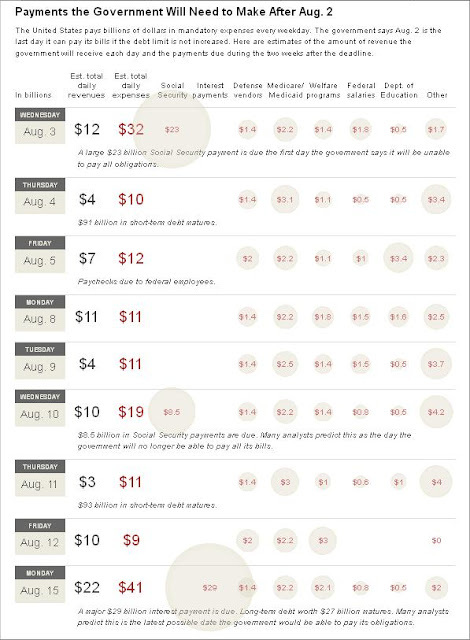 An interesting chart showing payments to be made by the US Government after Tuesday 2 August deadline when the debt ceiling will be reached and the US no longer able to borrow: on July 28th the US debt stood at USD 14,293.275 billion extremely close to the statutory limit of USD 14,294 billion. 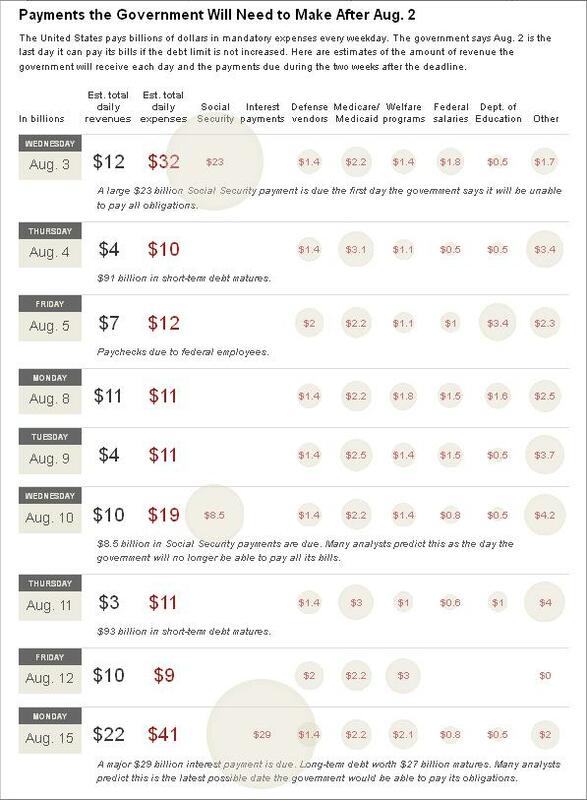 It is worth noting that the debt ceiling has been increased 78 times since 1960, or 47 times the USD 300 billion record reached during WWII. If a bipartisan deal is reached by then, expect the USD to rally and precious metals to fall. This is the best analysis I have read so far on Greece’s salvation, since Greece has de facto defaulted, however European (and other) official are disguising it. Since I do not see the point of reinventing the wheel, I post this analysis in-extenso without any comment. Confusion continues to reign supreme over what the French rollover plan does for the various entities. The details and mechanics are a bit sketchy, but I have attached the proposal that I found, and will use that as a basis for the analysis. As I go through the details, and incorporate the latest rating agency comments, the conclusion remains the same – this is a good deal for the Participants, a mediocre deal for the Troika, and punitive to Greece. The French proposal is slightly complex at best and convoluted at worst. Before digging into the specifics, let’s look at what a true rollover would look like. If Participants agreed with Greece to extend the maturity AND reduce the coupon AND do it immediately, that would be a clear example of a rollover that benefitted Greece. There are 3 key elements to a real rollover. The first is that they would agree to the rollover now. That would take away uncertainty. The maturity extension is the rollover, and the longer it is delayed, the better for Greece. The coupon on the new debt should be lower than the coupon Greece is currently paying. If all 3 of these criteria are met, and the new bonds are pari passu with the existing bonds, then I think everyone would agree that Greece benefits, the Troika would benefit, and the Participants would have made a sacrifice. The French proposal, as we will see, potentially does not satisfy any of the 3 aspects listed – it is not immediate, the coupon will be higher than existing debt, and the maturity extension is linked to taking some debt out of the market, so it’s not as clearly a benefit as the headlines make it seem. In any case, let’s assume Participants actually did the proper rollover. That should NOT trigger CDS. The ISDA credit derivative definitions for a Restructuring Credit Event have to meet 2 tests. The first part of the test is straightforward and is met if bonds are extended, or the coupon is reduced, for example. This condition would be met. The second condition is effectively that it is involuntary. If the actions of some bondholders can force other bondholders into an agreement then this condition would be met and there would be a CDS Credit Event. In the case of Greek bonds, that looks unlikely. I have only looked at the offering circulars from a couple of bonds, but there does not appear to by anything that could force a bondholder to change the terms of the debt. There is no reason, that on a €1 billion issue, €950 million could be exchanged and €50 million could remain outstanding. If that is the case, then there would be no CDS Credit Event under this true rollover. Of all the rating agencies, S&P, so far, has come out with the most comprehensive definition of what they would do. The first thing S&P said it would do is lower the Greek Issuer Rating to “SD”. First, I have to admit, that in all the years that I have followed the credit markets, I cannot remember seeing an “SD” rating before. I am almost certain that no regulator and no Participants have any rules based on the “SD” rating. So while Greece is rated SD, the regulators and Participants should have a lot of leeway on how to treat the debt, and since it would be performing, I don’t see why the status quo would be changed. S&P goes on to say that a D rating would be applied to bonds that are maturing and are subject to the plan. When will they do that? If they do it now, they will be rating bonds that are paying interest and will pay par at maturity as D. The rating agencies, which have enough problems with rating obligations too highly, will now be saying something is in default, when it is paying. I suspect that regulators and Participants would ignore the D rating and rely on the fact that the bonds are performing and are expected to be paid back at par. The rating agencies could apply the D rating right at the time of maturity, but that doesn’t have any impact on the Participants, because they would receive par on those obligations and no longer hold them. So any downgrade of existing obligations to “D” based on the proposal is unlikely to impact the Participants or regulators at all. The downgrade will only serve to keep track of defaults for the rating agencies’ annual default history studies. The key question will be what are the new bonds rated. S&P makes it seem as though the new bonds would have the current rating of the old bonds (“CCC”). So, again, status quo would be retained. A real restructuring would help Greece, help the Troika, and cost the Participants some money, and would avoid a Credit Event and demonstrate that the rating agency characterizations of default have no meaningful accounting or funding impact for the Participants. So, it looks like Participants agree to the plan now, but rollovers do not occur until each individual bond matures. The immediate impact on the debt maturity schedule for Greece is negligible. The Participants only share in the bailout if the Troika continues to provide Greece with funding. Retaining the original maturity schedule is useful for the Participants. If there is a default by Greece, the Participants will still hold their existing short dated bonds which can get higher recoveries in sovereign debt restructurings. Since the Participants do not provide a maturity extension up front, the key to Greece paying its debts is the continued willingness of the Troika to release tranches of promised bailout money. By waiting until each bond is repaid, the rollover plan addresses a couple of key issues. The rating agencies can rate the debt whatever they want, but if the bonds are paid in full at maturity the Participants will not have to take a write-down, so they preserve non mark to market accounting. That is important for some of the Participants. By waiting until the debt is repaid at maturity, it reduces the risk of some other credit claiming “fraudulent conveyance” or arguing about “off market price” transactions. Waiting until the bonds mature and are redeemed at par by Greece before “purchasing” the new bonds is better from an accounting standpoint for the Participants than agreeing now to extend the maturities when the bonds are trading below par. When a bond is redeemed at par, the Participant really receives 3 assets. The language is confusing, the use of the SPV obfuscates the actual investment, but it is actually fairly transparent to see through the headlines. For every €100 million of maturing debt a Participant holds, they will be able to retain €30 million to do with as they please. Of the remaining €70 million, they purchase 2 assets, a AAA rated 30 year, zero coupon bond, and a 30 year Greek amortizing bond. Yes, the plan calls for them to purchase 1 asset, an SPV, but it is a simple SPV and is worth breaking the SPV into its two components. The Participant will buy €70 million of an SPV. The SPV will be “principal protected” by a AAA rated asset and provide a coupon of between 5.5% and 8.0% depending on the GDP growth of Greece. But let’s look through the SPV and see what the Participant really gets. €20 million is spent to buy the AAA zero coupon bond. The zero coupon bond should cost about 30% of face 1 and the actual proposal uses a price of 28.5%. So the investor owns a AAA rated, zero coupon bond, that they spent €20 million to buy and has a face value of €70 million. This asset might be used to get a principal only AAA rating on the SPV Note. It might help with regulatory capital even, if the Participants can use a principal only rating, but in any case it should be viewed as a separate asset. So the remaining €50 million actually goes to Greece. Of the €100 million of debt the Participant owned, €30 million is repaid in cash, €20 million they agree to use to buy a 30 year zero and €50 million goes to Greece. Since Greece clearly needs all the money it can get, the only logical place for Greece to receive the €50 million the Participants are keeping is from another loan from the Troika. Whatever entity (possibly some iteration of EFSF) sold the zero coupon bond to the SPV is likely to provide financing to Greece. It only makes sense since they will have €30 million of proceeds that needs to be invested somewhere. The remaining €20 million must come from the promised tranches of Troika bailout funds. What does the loan to Greece look like? It is possible to back out the details of the €50 million loan to Greece. The Participants expect to receive €70 million at maturity from the SPV, so that the asset they paid par for can be redeemed at par. Therefore it is logical to conclude that the SPV is not relying on any money from Greece for principle redemption at maturity. The SPV is supposed to pay a minimum of 5.5% coupon on the €70 million face amount of the SPV note. That is €3.85 million per annum. That has to be coming from the Greek loan – the SPV only has 2 assets, the Greek loan, and the zero coupon bond. The SPV (and Participants) are relying on Greece to pay €3.85 million per year for 30 years. This is just like a mortgage. In fact it is a 30 year mortgage, with initial amount of €50 million with annual payments of €3.85 million. That is equivalent to a 6.55% mortgage rate. Since none of the GGB bonds maturity in the next 18 months, has a coupon higher than 5.25%, the Participants aren’t helping Greece on their annual interest payments. If Greece is going to see a reduction in average coupon, it would have to be coming from the loans from the Troika. So far, those loans still seem to be coming around 5%, so there is no current interest expense benefit for Greece. This mortgage loan to Greece is very creative by the Participants. It helps explain why there are no details of the loan terms in the proposal. It is a bit difficult to work out, but a 30 year, 6.55% mortgage is the only possible way to explain the cash flows. Not only is the interest rate above current coupon rates, so Greece will be paying more, the duration of the mortgage is far less than 30 years. The Participants would have you believe that they have lent Greece money for 30 years. The reality is the loan has a much shorter duration and will be half paid off in the 20th year. The terms, as you dig deeper, once again seem to be better for the Participants than for Greece. I almost forgot something. The 0 to 2.5% additional interest the SPV will be paying based on the GDP of Greece for any given year. That would be an additional payment of up to €1.75 million each year. That payment has to be coming from the Greek loan asset the SPV holds, since it cannot be coming from the zero coupon bond, by definition. If that happened in the first year of the SPV it would represent a payment by Greece of 3.5% of the amount borrowed. Since the loan is a mortgage and principle is being paid down, the potential additional payment by Greece as a % of interest is astronomical near the end of the loan. If Greece only owes half the original principle by the end of year 21, that same payment would be 7% from the perspective of Greece, on top of the 6.55% they are already paying. This coupon “kicker” linked to GDP that is paid on the full notional of the SPV is problematic for Greece since they are paying a “kicker” on a notional that is 40% more than they received. The problem becomes onerous because that kicker is linked to a fixed amount, yet the money Greece borrowed from the SPV is being repaid annually like any other mortgage. It is only safe to assume that the annual principle payments have to be funded elsewhere, so Greece will owe interest on those borrowings too. The Participants are not lending to Greece for 30 years, the duration is much shorter, and the coupon payments start out potentially high, and become usurious in the later years. The structure is designed in a such a way to make it look like the Participants are being helpful – 30 years at a low coupon, but separating the SPV into its zero coupon component and the loan to Greece clearly demonstrate that the terms being offered to Greece are far worse than the headlines that the Participants are selling to the public. I would be surprised if Greece agrees to the loan terms as included in the French proposal and wonder if they have even been consulted?